For a few, blessed weeks each May-June, the cherry trees here in the Golan Heights take their turn in the season and strut their sweet stuff. This year, the farmers on our moshav extended a generous invite and welcomed us locals to come out to the fields and enjoy the last pick of the season. My eight-year old son and I had been looking forward to it for days. We arrived late in the day, hours after most folks and didn’t expect to find much. In fact we were cautioned by several different people, farmers alike, that there really wasn’t too much left to pick at all. The big harvest was well over – the locals had already picked through the leftovers and we would be lucky if we found anything. I’m not fit to argue with that kind of knowing. In an effort to prepare him for what I assumed would be disappointment, we decided that we would be super happy if we found just one cherry. So off we went, bouncing up dirt roads through acres upon acres of apple orchards and vineyards in search of a single cherry. We found the field and my boy got right to it. He set his sights on a particular tree and climbed right up the base of the trunk and just stood there… looking. 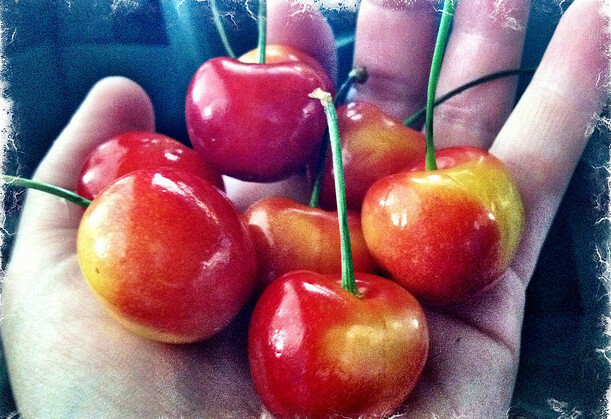 It took a about a half a minute or so, but it happened, right before our eyes – sweet, red, and down-right enchanting cherries began to appear like lost treasures. We discovered quickly that my height offered value in terms how high we could reach… but his size offered a whole different skill set. Not only can he climb better, but he can see things from angles that I can’t. We worked well together. We were a straight-up cherry-pickin’ task force and by the end of our hour or so there, we had filled a basket with about 2 1/2 lbs of tasty, beautiful, and dare I say, perfect cherries. Precisely because the pickings were so slim, the search for them was all the more fun. Every cherry we found was a gift from G-d. We took to saying: “Thank you Hashem” just about every time we plucked a stem from her branch. When we paused mid basket-fill to run this experience by our taste buds (my daughter calls them “taste buddies”), we said the traditional blessing for fruit: “Blessed are You, L-rd our G-d, King of the universe, who creates the fruit of the tree.” I meant it in a way that I usually don’t. It is so easy to forget how awesome the earth is; how awesome the notion that when we treat her right and the weather complies… we get to eat. And not just eat any ol’ thing… good food; real, actual food, more or less the way it was intended since the story of creation first aired. My instinct this last Friday was to bail out and not even try to go picking. There was too much evidence pointing to the disappointment likely to follow in schlepping little ones out into the fields on a hot day. But my kids tend to have a lot less trouble tuning their frequencies to “wonder,” “possibility” and “what if it does work” than I do. How sweet it is when I make the time to reset my dial and step into that blessed space with them. Judy Garland’s take on cherries for your listening pleasure.